December has arrived and with it has come the snow! Which means that my 2018 racing season is officially over. This year’s racing season was cut short due to having my labrum in my hip repaired. BUT, with the surgery, I am now fully recovered and better than ever! I’m very thankful that my recovery was during the hottest time of year so I was ok with not running. My first race back from hip surgery was one of my favorites, the Rodeo Stampede 5k on September 8, 2018. This race is held during our Annual Tri-State Rodeo in Fort Madison, Iowa, which is one of the bigger and best rodeos around, bringing in multiple high level cowboys and cowgirls during the ‘The Cinch Shootout’. For my very first race back from hip surgery (I was kinda nervous about this) I went in thinking to myself, “You’re doing this as rehab, not racing. Just be happy that you can run again.” So I started the race and ran about 3:30-4 minutes and walked 90 seconds. The last mile I pushed myself a little more than what I was intending to do, but thought why not. I crossed the finish line in 32:00.6 with an average pace of 10:18. I had so much fun getting back out there and competing a little. I did not place during this race but that didn’t bother me. I was happy that I was able to do it! Needless to say, later that day and the following day, my hip was sore. So I listened to my body and gave it a few extra recovery days which did just the trick! My next race was actually a virtual run (my first one ever, too! ), which for me was a great stepping stone back into the racing world. At that time I was doing running/walking intervals and had built myself back up to just over 3.1 miles. (I was a great patient and listened to my doctors, physical therapists, my body and most importantly, myself with having an athletic training background. Usually we’re the worst patients-proud self moment!) On September 22, 2018 I participated in The Great Pumpkin Virtual 5k and clocked myself at 33:07 with an average pace of 10:39. In all honesty, I was extremely happy with that time all things considered. It was a solid base to give myself to work from. Can only get faster from there, right?! During the following week, I continued to build on my running/walking intervals; more time running and less time walking. So when I participated in the Kickoff to Kinnick 5k in Iowa City, Iowa the next weekend, on September 22, 2018 I was hoping to be able to run at least 5 minute intervals with 30 second walking intervals. However, this race had about 4,000 people who registered so there were people everywhere with all sorts of different racing abilities. My aim was to hit around 30 minutes or faster. As I was running and hit the 5 minute mark, I felt good and decided to push my limits and see what my hip could really do! I ran 11 minutes straight, over 1 mile! I was so proud of myself. I remember only walking 3 times during the entire race and ran way more than I intended to. I crossed that finish line in 29:39 and felt such a sense of accomplishment because I reached my goal of going sub 30 minute 5k and even better, my hip wasn’t even that sore the following day! Win, win! The following weekend, October 6, 2018 I participated in the 12:1 Run 5k. This race meant so much to me for multiple reasons. First, the very first 5k where I was able to run the whole thing without stopping! Second, new season 5k PR, coming in at 27:56 with an average pace of 9:01! And third, I won my age division! I felt like I was on top of the world the rest of the day. What made this even more awesome was the fact that my hip continued to feel great, no pain or soreness at all. I definitely felt like I was back to my old self, pre-hip labrum tear. And what a great feeling to have! October 13, 2018. New long run coming in at 4 miles. Felt like a queen and on top of the world. Slowly, but surely, I’m getting closer to being back to training for a half marathon! Next, I participated in the Glowing Pumpkin Run 5k on October 18, 2018. This 5k is awesome because it’s held at night on a trail and is lit with lights and lanterns the whole way. Such a cool atmosphere and the Halloween decorations are on point. One of my favorite fall races and finishing in 26:50 with an average pace of 8:37, I don’t think any other race could top this one. Emotionally, I was feeling like I could conquer anything and that I was one tough chick. October 27, 2018 I participated in something extra fun, the 5th Annual Spooktacular Boo-Athlon (5k run & 10 mile bike), and in costume I may add! The weather was perfect for the extra challenge of this race. I completed the race in 1:21:48 which I was pretty excited about considering I had just donated blood less than 48 hours prior to race day. I was excited to be continuing to push my body further and harder than I have since hip surgery and to continue to work hard getting back to my goal of running another half marathon. The following day, October 28, 2018 I participated in the WIAR Rescue 5k (an animal rescue organization’s fundraiser) and finished in 28:52. Not my fastest race but all things considered (donating blood and racing the previous day), I was quite proud of pushing thru tired, heavy legs and working on my mental toughness game. 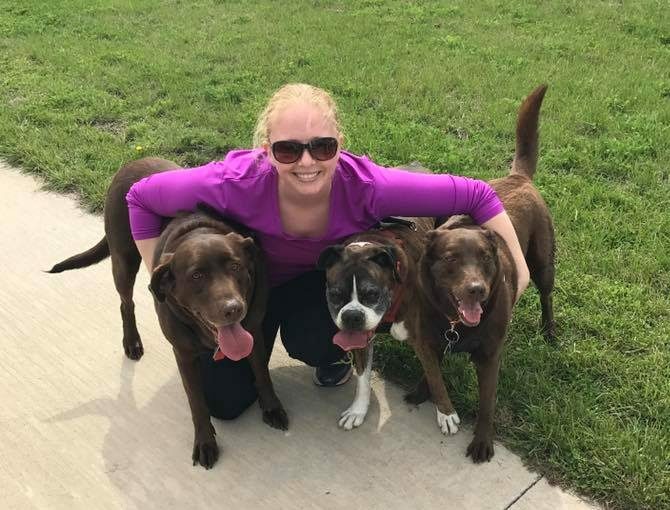 November 3, 2018 I decided to head out the door with my 2 chocolate labs and conquer a new long run, coming in at 5 miles! After 4.5 miles I had to have my husband pick up my dogs because they were beat and I had to run the last half mile on my own, finishing in 48:26, with an average pace of 9:40. I can now officially say that I outran my dogs! I know I still have a long ways to go but I am extremely happy and excited about the progress I’ve made. When I found out that I tore the labrum in my hip, I was worried that I wouldn’t be able to run pain-free again or be able to run half marathons. I felt like my hip would never be the same and I would have issues with it forever, so having accomplished all of this and then some less than a year after surgery, while continuing to be pain-free, is a true testament to patience, discipline, dedication & hard-work!